Something is going wrong on many college campuses in the last few years. Rates of anxiety, depression, and suicide are rising. Speakers are shouted down. Students and professors say they are walking on eggshells and afraid to speak honestly. How did this happen? 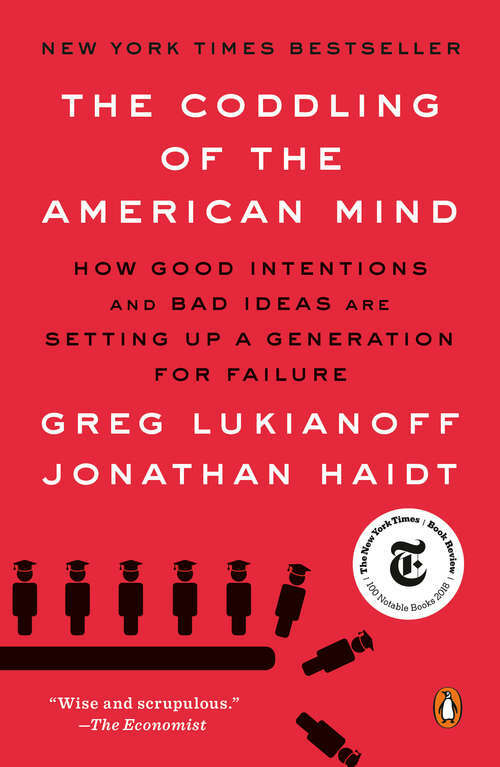 First Amendment expert Greg Lukianoff and social psychologist Jonathan Haidt show how the new problems on campus have their origins in three terrible ideas that have become increasingly woven into American childhood and education: what doesn’t kill you makes you weaker; always trust your feelings; and life is a battle between good people and evil people. These three Great Untruths are incompatible with basic psychological principles, as well as ancient wisdom from many cultures. They interfere with healthy development. Anyone who embraces these untruths—and the resulting culture of safetyism—is less likely to become an autonomous adult able to navigate the bumpy road of life. Lukianoff and Haidt investigate the many social trends that have intersected to produce these untruths. They situate the conflicts on campus in the context of America’s rapidly rising political polarization, including a rise in hate crimes and off-campus provocation. They explore changes in childhood including the rise of fearful parenting, the decline of unsupervised play, and the new world of social media that has engulfed teenagers in the last decade. This is a book for anyone who is confused by what is happening on college campuses today, or has children, or is concerned about the growing inability of Americans to live, work, and cooperate across party lines.